Our broad range of projects stems from our commitment to holistic sustainability and the healing of our community. Among our initiatives are efforts towards securing food justice, renewable energy, clean water, sustainable building, as well as empowering education and Lakota culture and tradition. Like the Lakota medicine wheel, the principles of permaculture encourage harmony among people, our surrounding environment, as well as our physical and spiritual needs. As a natural counterpart to our medicine wheel, we employ the principles of permaculture to facilitate the conditions that enable the resilience of our people, restoration of our environment and revitalization of our culture. The universal principles of permaculture allow for the functions of our many of our initiatives to overlap, serving more than one end goal, and in some cases, several individual projects may work towards the same purpose. 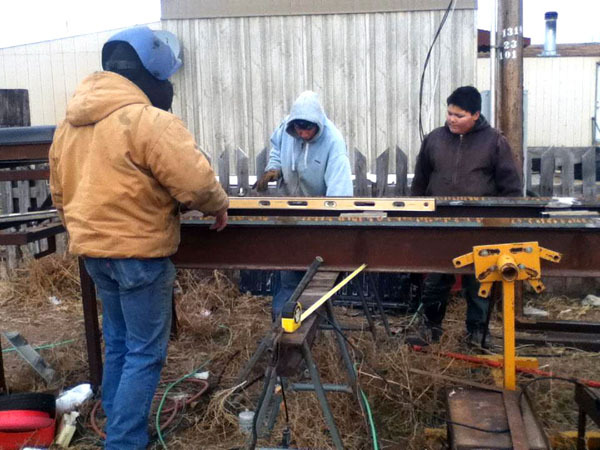 All of our projects, however, are part of our work to create a demonstration site and supporting education programs to enable the efficient implementation of our methods across the Pine Ridge Indian Reservation, as well as our greater community. We see our program as an idea incubator, as we collaborate with our growing network of experts to explore innovative solutions to the existing challenges and deficiencies we face here in the Oglala Lakota Nation.